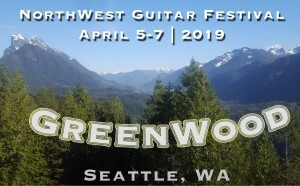 The 28th annual Northwest Guitar Festival, April 5th-7th will take place in Seattle, WA. This year’s Festival will feature top soloists and ensembles in addition to the collegiate and youth competitions, concerts, masterclasses, and more. Friday and Saturday events will take place at Phinney Ridge Lutheran Church, 7500 Greenwood Ave N, Seattle, WA 98103. Sundays events will take place in Brechemin Auditorium at the University of Washington School of Music. Festival events include concerts by Isaac Bustos; Michael Nicollela and Alexandra Picard; Oregon Guitar Quartet, Duo Borealis; and Andrew Picard. The festival also includes workshops, masterclasses and senior and youth competitions.